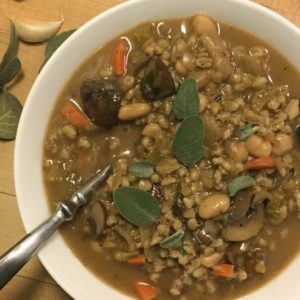 Warm up winter nights with a hearty stew bursting with nutritious whole grains, beans, vegetables, and herbs. It’s inexpensive, easy, and makes enough for fridge and freezer to boot! It was a recent trip to Kripalu and a bowl of their mushroom and barley soup that reminded me of this traditional favorite. 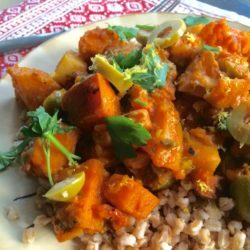 In fact, I used to make this (vegan) dish all the time when I cooked in a local vegetarian café in Albany, New York, where I went to college. Although a classic that certainly stands on its own, I’ve added a few things here today for oomph. I included Great Northern white beans for even more fiber, protein, and phytonutrients and tossed in lots of herbs, fresh and dried, which play together so well with the other ingredients. 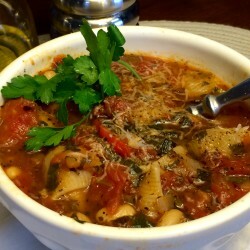 It’s a super savory, soul warming dish that really hits the spot on a cold night. And it takes the same amount of time, however much you make, so why not go with the quantities here for a meal that will keep on giving throughout the week and freezes beautifully for another occasion? 2. Bring about 1/4 cup olive oil to shimmer in medium high heat in a large sauté pan (or pot), then add the carrots and celery. Season with salt and freshly ground black pepper and 1 teaspoon of thyme and cook until firm-soft (i.e., not mushy) then move to a plate. 3. Add onions to the same pot; you’ll likely need to add a few more teaspoons of olive oil here. Season with salt and pepper, and add 1 teaspoon thyme and 1 teaspoon rosemary. Sauté about 10 minutes over medium heat, until translucent and somewhat caramelized. Then add crushed garlic and white beans, mixing about 30 seconds until garlic is fragrant. Deglaze with 1/2 cup of beer (or stock), reduce a bit (most of the liquid should be gone), and move to another plate. 4. Sauté 4 cups mushrooms in the same pot, adding again a bit more oil as needed, and season with 1 teaspoon remaining dried thyme and 1 tablespoon chopped sage. Deglaze with with beer (again!) or stock, leaving some liquid remaining. 5. When barley is not quite cooked, after about 45 minutes, add dried mushrooms to the mixture to rehydrate and soften. Stir until combined and let sit an additional 10-20 minutes, until barley is fully cooked and mushrooms are soft. 6. Add all cooked vegetables to the pot with the barley-mushroom mixture, along with the fresh parsley; stir and taste. You can create a thinner dish—more soup-like—simply by adding more stock or, in a pinch, water. Season with additional salt and pepper and tamari. (Note: tamari or Bragg’s simply adds an umami boost and richness; it doesn’t make the soup taste like soy sauce.) You may well need one or more teaspoons of salt here if it tastes bland, as we haven’t added much yet; add a bit at a time and taste/taste/taste because palates differ on salt perception. And you’ll definitely want to add a bunch of freshly cracked pepper, too. Makes a huge vat. (About 20 cups.) Quantities can be halved for a smaller batch. P.K., this dish was amazing! (or umami-mazing?) Gotta put this in my regular repertoire. Great to make on a Sunday and then eat all week. Thanks, Cat! So glad you liked it!